The answer to the question of how to save money on dental treatment is a simple one, go to Mexico! We’re joking, don’t do that unless you have done thorough research on the dental provider. We are fortunate in Canada that the quality of work we see from our colleagues is of a high standard. A wide variety of treatment come out of foreign countries, both good and bad. The main problem with getting dental treatment done in a foreign country is dealing with post-treatment complications. Many people expect a local provider to warranty or repair work done by another dentist. Unfortunately that rarely happens as the local dentist is put in a difficult situation not knowing the treatment plan, materials used or complications that occurred during the procedure. Unless you are looking to get a nice vacation out of the deal, we have a few other ways to save money on dental treatment as opposed to going out of the country. Get dental insurance. Health benefits can be obtained through an employer, government or individually. They can be a great way to help subsidize the cost of dental treatment. Make sure you understand what your insurance plan covers. Your plan will likely have a yearly maximum and any amount over that is 100% your responsibility with no assisted pay from the insurance provider. Keep in mind that your dental benefits is a plan between you and your insurance provider. A dental clinic will help you understand your benefits and submit proposed treatment to your insurance provider for a pre-authorization approval but ultimately it is your responsibility to know what you are covered for. Due to privacy regulation, insurance providers are disclosing less information to dental clinics. Therefore the burden has been placed on the patient to know their policies and what they are responsible for paying out of pocket. Schedule regular visits with ongoing maintenance. The patients we see in our clinic that spend the least amount on dental treatment are those that come in on a consistent basis. It may seem counter intuitive. 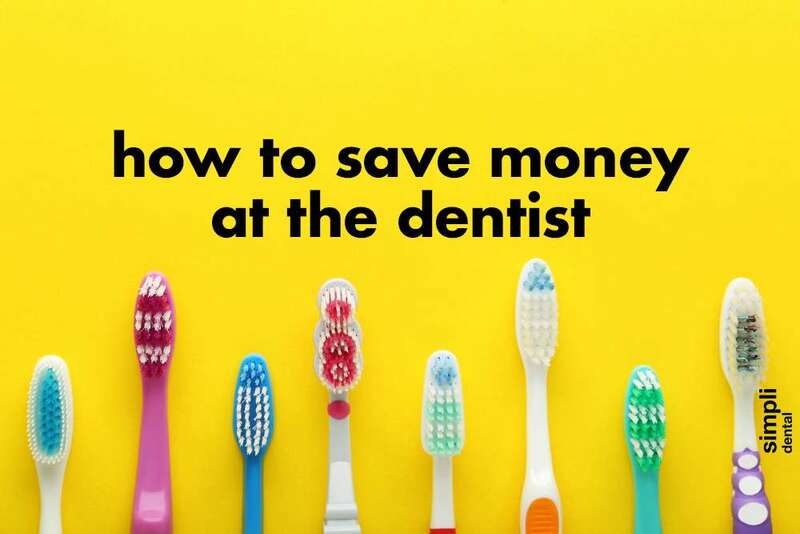 Why would visiting the dentist more often result in lower costs? This is due to the fact that with regular visits, oral health problems can be detected early resulting in the treatment being less costly. For example, a cavity detected early on can be placed with a filling for a couple hundred dollars. If left longer to the point where it can be felt and is painful, it could require root canal treatment, posts, fillings, and a crown, resulting in several thousands of dollars. Find a provider you trust(Like Simpli Dental?). Having confidence in your dentist, hygienist and clinic staff is crucial in knowing you are receiving the best treatment. A good provider will give you all of your treatment options and tell you what they think is best for your oral health. By seeing someone that you trust, you will know you are getting the most honest treatment possible. Listen carefully to treatment plans and ask questions. There are many options to fix a tooth and sometimes it can be overwhelming. Some are better than others and many vary in price. Make sure to ask your provider questions to ensure you understand what all of your treatment options are. Many times, we focus on one treatment option and block out others that may be more affordable. Know the long-term effects. A quick and cheap fix may end up costing you more money in the long run. For example, an extraction is often a more affordable option than saving a tooth that may require several appointments and multiple treatments to fix. However, the space you are left with may cause problems when teeth shift or bone levels recede. If you decide later on that you want to fill the space from an extraction, you may end paying more because it is more complicated to fix than if it were done earlier. Get a second opinion. You have options and you should explore them. If you are proposed a treatment plan that you don’t have full confidence in, go and get a second opinion. There are many providers available that will give you their professional opinion that you can compare. If you have questions or would like to see a dentist for a consultation, please contact us. Dentists accepting new patients in Regina Why do I need my teeth cleaned?